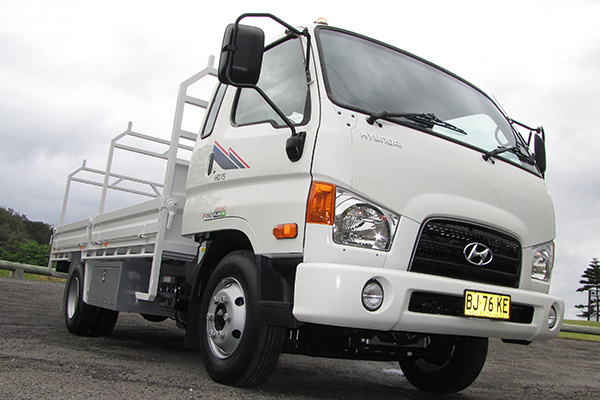 Joining what is a very crowded market is Hyundai’s ‘heavy truck’ — well the heaviest they offer in Australia although the Korean domestic market has access to the full range of rigids and prime movers — the HD75 light rigid. 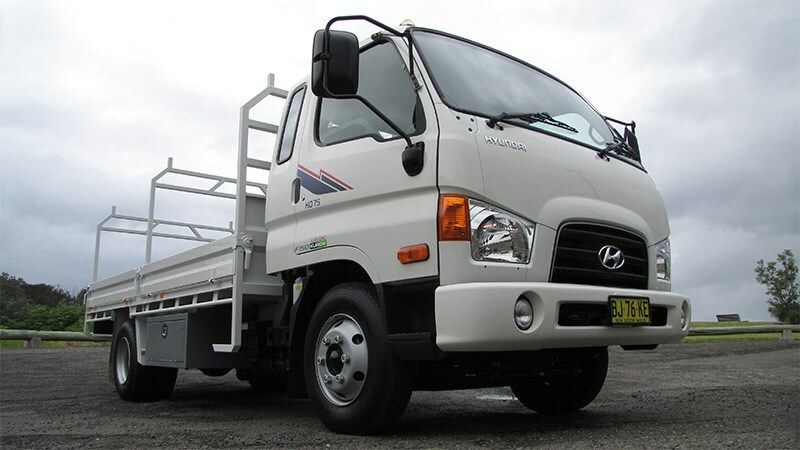 Underpinned by the same technologies as the lighter HD45 and HD65 models, the HD75 extends Hyundai’s foothold in the competitive light-duty market, offering a choice of wheelbases and cab sizes. While the current stock is all ADR 80/02 compliant, arriving in country in late 2010, there is an ADR 80/03 version in production in Korea, which is expected to arrive late this year as existing stocks are exhausted. 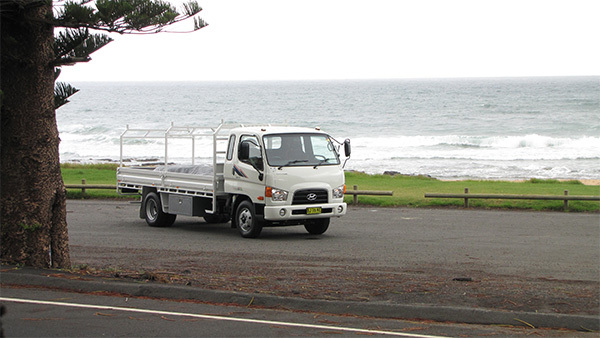 Visually, the HD75 might appear to be a generation behind contemporary Japanese styling but it offers the advantage of differentiating the Hyundai range from its competition, as well as introducing an element of character to the trucks. The front view certainly reinforces this perception, with the upward and outward design of the headlights making it look like it is concentrating on the road. Combine this with the grille encased in a raised front panel and the slotted bumper and it is easy to visualise a face staring out from the truck. Also distinctive is the slight rounding of the front panels, which helps create the ‘face’ and also offers a little extra in terms of interior space for feet, as well as smoothing airflow over and around the cab, vital in a cabover engine design. Factor in the roof clearance lights and the delightfully complex door mirror supports that do a great job of improving rearward vision without impeding side-vision at roundabouts or T-intersections and the HD75 certainly stands out in a crowd. Other little niceties from the design studio that made it past the clay model stage are the deep channels extending backwards along the doors from the headlights that keep the mirrors clear of dirt, grime and water runoff from the front of the cab, as well as the recessed door handles and access step, which minimise wind noise around the cab. The 3.9-litre F150 four cylinder produces 110kW (147hp) and a healthy 579Nm (430ft-lb) from its single overhead cam design, making use of common-rail electronic fuel injection, and an air-to-air intercooled turbocharger. Unlike the HD45 and HD65 that use five-speeders, the power goes to ground via a six-speed synchromesh manual, with the extra cog transforming the HD75 — particularly compared with the HD65 that also uses the F150 engine. Where the HD65 suffered a flat spot courtesy of the gap between second and third that required the engine to be taken high into the rev range, the HD75’s extra ratio makes the gaps smaller and keeps the engine in its sweet spot for longer. In addition to the regulation standard cab, Hyundai is offering a ‘Super Cab’ version that adds a vertical side window in the ‘stretched’ section of the cab aft of the door. While it may not do much for rear vision, it adds to the ‘airy’ feel of the cabin by letting in extra light. First attempts at producing an export model can sometimes be hit-and-miss affairs, particularly when it comes to designing the interior, with some interesting motifs and fabrics making an appearance. In this case, though, it looks like the design team went and spoke to their counterparts in the passenger car division, getting some hints on what does and does not work in Western markets. The result is a generally pleasing and ergonomic design, with switches and gauges placed where occidental drivers would expect them to be, while the blend of fabric and vinyl makes for a comfortable environment. 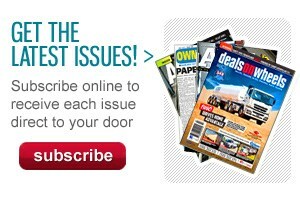 Having said that, the first thing you see upon opening the door is the red driver’s seat. It stands out from the background, but it is worth seeing as it offers a coil-spring suspension to improve the ride, the first in the class to offer such a luxury. The seat itself feels as though it was designed for the passenger division, with good shaping and support for not just a variety of body shapes but also different driving styles, and helps combat operator fatigue. While the door only opens to 70 degrees it is still easy to climb in and out, with the recessed step coming in handy thanks to the high-riding suspension, along with the grab handle mounted on the B-pillar. Dropping into the seat, which offers four-way adjustability, the first thing that presents itself is the dash, featuring a clear and simple layout of road speed, engine revs, engine temperature and fuel level. In addition, there are warning lights for other functions, including park brake, exhaust brake, high beam and oil pressure, all easy to see when needed. The padded steering wheel is not only comfortable to use but can be adjusted for height and reach. Combine that with the seat adjustments and pretty much anyone can find a comfortable position to drive from, while column-mounted stalks take care of lights, indicators, wipers and exhaust brake all fall easily to hand and become routine with repeated use. The handbrake and gearshift are far enough back to ensure they are not in the way while driving but close enough that you do not need to be a contortionist to use them. And there is enough sideways separation of the steering wheel and gearshift that the 5-6 plane does not interfere with the driver’s leg when using the upper gears. The twin sun visors are large without being intrusive or cutting the driver’s view. They fold up into the padded roof lining while not in use but can be quickly swung down, while there is enough resistance to hold them at the preferred angle without any annoying swing. While the windows are factory tinted, the standard air-conditioning unit does an excellent job of heating and cooling — a cold front moved in during the test drive, requiring a quick adjustment from cold to hot, easily accomplished without looking away from the road thanks to good-sized rotary controls. The other convenience item is the AM/FM/CD/MP3 stereo: the sound fills the cab nicely without being tinny or distorted, while the buttons are big enough to make accurate alterations safe on the move. The imitation wood veneer trim looks good in the cab and provides a neat contrast to the high quality grey vinyl used to cover other flat surfaces in the cab. 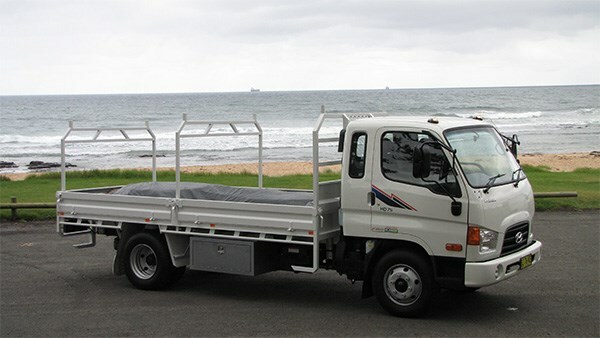 While most operations would have just one or two people in the cab, the bench seat offers a third seating position in the centre, however most operators are more likely to fold the back down and use the extra two drink holders and storage area, while the flat top also comes in handy as a work table for filling in paperwork. Although spacious, the glove box largely goes unused in most trucks, instead holding warranty and handbooks, and maybe the odd pair of gloves. Most drivers will prefer the overhead storage spaces, the net front stops wallets and other bric-a-brac from turning into missiles under heavy acceleration, while the space itself is large enough for most notebooks and diaries. Hyundai also takes into account the amount of portable electronic devices used by drivers in the modern world, including telephones and satellite navigation systems, providing two power outlets, one a dedicated 12V outlet and the other a 24V cigarette lighter, while a battery saver cuts the power when the ignition is switched off, preventing embarrassing calls for assistance. Although the actual drive leg was relatively short, covering about 100 kilometres, the HD75 quickly revealed itself to be a competent performer, loaded as it was to approximately 6.5 tonnes. 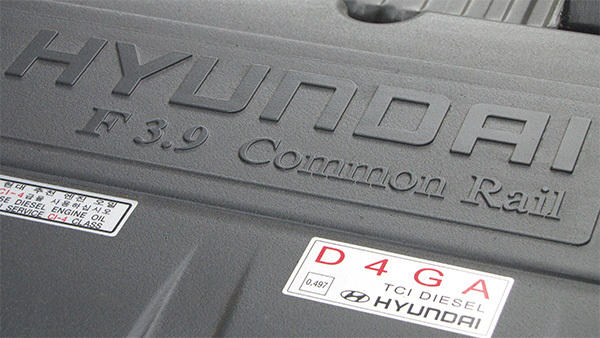 With peak power arriving at 2,500rpm, the risk of the engine being overly noisy at highway speeds was always present, however Hyundai’s NVH engineers have done a great job insulating the cab. And drive-by noise is also controlled thanks to clever engine packaging, with most of the sound kept within the body. The controls are light, not requiring much effort at all, in keeping with the expectations of the light-duty category, making gearshifts simple. Although there was a slight notchiness to some of the shifts, this is often a symptom of new equipment and can be overcome by slowing the shift and not over-revving the engine. While the controls were light, they did not feel fragile; it is a case of not needing to overwork the equipment. The steering is direct, with the previous vagueness around dead centre eliminated. There is still some play at the straight-ahead position but it is less than before and now even the smallest movements translate to action at ground level. Despite this, the HD75 is not twitchy, simply responsive, allowing the driver to accurately predict what is happening underneath them, which leads to more precise manoeuvres, especially when reversing or parking in confined spaces. 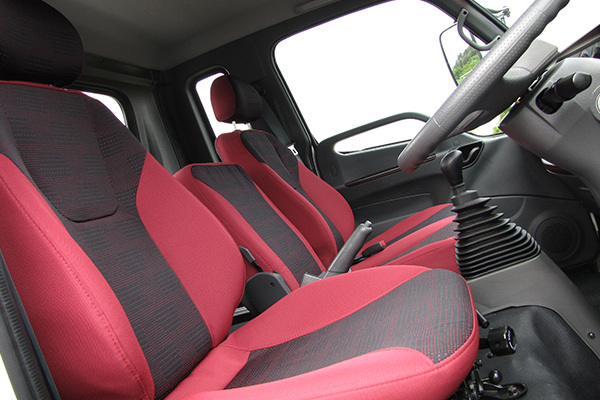 While the suspension seat is comfortable to sit in, it really comes into its own when the truck is moving, working in combination with the suspension and the cab’s own liquidfilled rubber suspension to provide the driver with a smooth ride over everything short of a four-wheel-drive track. Suspension noise is well damped with no harsh banging or crashing reaching the cabin, all adding to the smooth and relaxing nature of the HD75, when it is working hard. 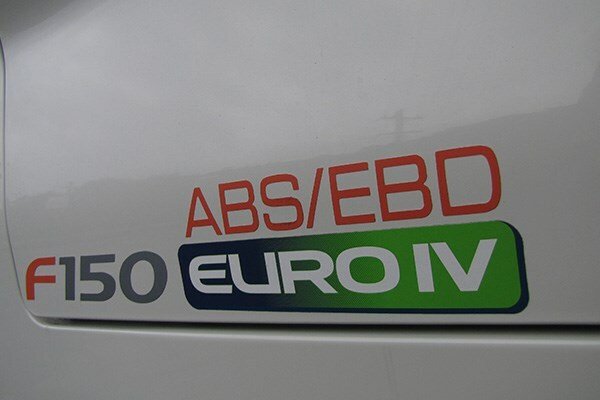 Following the trend the company sets with its passenger range, the HD75 is well-equipped on the safety front, with ABS brakes and Electronic Brakeforce Distribution, however there was no need to see just how well they worked on the familiarisation run. What did impress was the exhaust brake. The test leg took in both the ascent and descent of Bulli Pass south of Sydney. While this has now been superseded by Mt Ousley as the main route between Sydney and Wollongong, there is no doubting it provides a solid workout for all vehicles. The HD75 proved an impressive performer on both legs, with the exhaust brake washing off speed and then maintaining the speed under the posted limit in third gear without constant brake applications. On the way back up, the F150 engine and six-speed transmission combined well to provide effortless pulling power, so that the HD75 was able to power up the steep climb without struggling, despite the best efforts of the driver to induce problems. 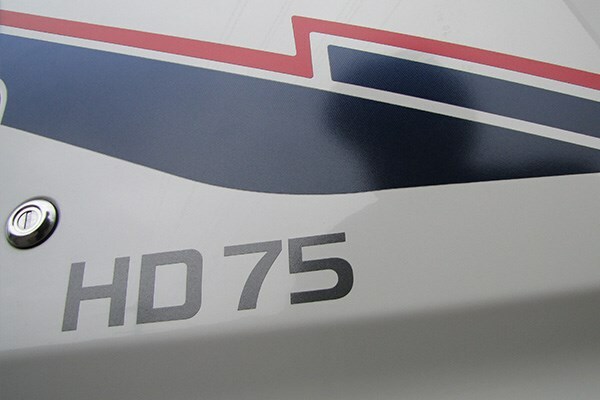 Despite being one of the newer players to the Australian market, the HD75 is a competent performer, in a market segment that demands competence as a minimum. In its favour, there is probably less brand loyalty in this segment than in the heavier classes, negating the relative newness of Hyundai as a truck seller in Australia. The trucks are well-built, with impressive drivelines, particularly the six-speed transmission, all of which Hyundai is backing with a 3-year/200,000-kilometre warranty, which should also win friends. 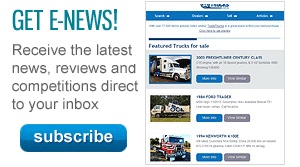 Click here to find Hyundai HD75 trucks for sale. 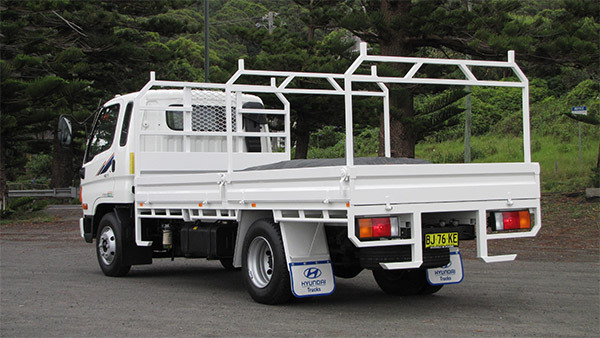 Click here to find new specs for Hyundai HD75 trucks.